Product prices and availability are accurate as of 2019-04-20 08:54:46 EDT and are subject to change. Any price and availability information displayed on http://www.amazon.com/ at the time of purchase will apply to the purchase of this product. There is a plexiglass panel behind which is some folded cash. You can see, but can you get it?? Uses a classic puzzle technique to release a locking mechanism which will allow the panel to be opened. A great way to give a gift of cash.or gift card or tickets. Made by Creative Crafthouse hardwoods with high quality fits and finishes. Additionally our design uses thicker wood at key joints for higher strength that will be found in Asian products making puzzles with this locking pin technique. 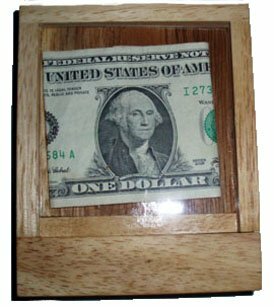 A fun, clever way to give a gift of money or a gift card! Can be used over and over again!